In honor of Labor Day, StoryWeb focuses this week on a ground-breaking piece of American fiction that brought to national attention the plight of industrial workers. Rebecca Harding Davis’s 1861 short story, “Life in the Iron Mills,” is one of the first pieces of literature written about what is now West Virginia. The story takes place near Wheeling, in the state’s northern panhandle, a region that actually has more in common with nearby Pittsburgh than with the coal mines of West Virginia. Nevertheless, “Life in the Iron Mills” is a hard, gritty story of industrialization in what we might call the greater Appalachian region. The story brings to mind Thomas Hobbes’s observation that life is “nasty, brutish, and short” – as well as Charles Dickens’s 1854 novel of industrialization, Hard Times . The story’s characters – Hugh Wolfe and his cousin, Deborah Wolfe, both of whom are Welsh immigrants – are not as vivid as Harriette Simpson Arnow’s heroine, Gertie Nevels, in The Dollmaker. Wolfe and Deborah are not characters we come to know deeply. But their situation is riveting and compelling. We feel – as Davis intended us to feel – outrage at the way the mill owners chew up and spit out their workers. A cloudy day: do you know what that is in a town of iron-works? The sky sank down before dawn, muddy, flat, immovable. The air is thick, clammy with the breath of crowded human beings. The idiosyncrasy of this town is smoke. It rolls sullenly in slow folds from the great chimneys of the iron-foundries, and settles down in black, slimy pools on the muddy streets. Smoke on the wharves, smoke on the dingy boats, on the yellow river. Davis’s story is one of the earliest examples of the “local color movement” in which writers from regions across the United States focused on the dialect, mannerisms, and customs of particular locales. Most of the local color writers – such as Sarah Orne Jewett and Kate Chopin – featured “slice-of-life” sketches. But Davis, importantly, uses what would become stock-in-trade local color techniques to expose the brutality of the mill system. For this reason, she is considered one of the early pioneers of social realist fiction or proletariat fiction. Davis can also be linked to another American writer who exposed the dehumanizing effects of the industrial revolution. In his 1853 short story, “Bartleby, the Scrivener,” Herman Melville looks at the toll that mind-numbing, soulless, bureaucratic work can have on the clerks, lawyers, and paper-pushers of Wall Street. At first glance, Bartleby, the scrivener (or human copy machine), and Huge Wolfe, the iron mill worker, may seem to have nothing in common. But read together, read against each other, read in tandem, it becomes clear that these two stories were written in nearly the same moment in time. Hugh Wolfe dies from the ravages of his life in the iron mills, and Bartleby dies as a nearly forgotten pawn in the legal machine that keeps the industrial system going. Ready to read Davis’s story yourself? Read it in the archives of the Atlantic Monthly, where it was originally published to much acclaim. If you want to go further in your exploration of Davis’s work, be sure to check out A Rebecca Harding Davis Reader . You may also want to read Sharon M. Harris’s book, Rebecca Harding Davis and American Realism . 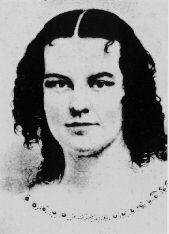 Image credit: Rebecca Harding Davis, image in the public domain, https://commons.wikimedia.org/wiki/File:Rebecca_Harding_Davis.jpg.